Burkitt Lymphoma is a rapidly progressive lymphoid malignancy requiring a prompt diagnosis and institution of therapy. Often, therapy needs to be instituted prior to the results of molecular studies which typically confirm the diagnosis. A goal of initiating therapy within 48 hours of presentation has been proposed as optimal treatment for Burkitt lymphoma. Therefore, a high degree of suspicion is required along with surgical colleagues who can rapidly obtain tissue for review by an expert hematopathologist. The endemic variant of Burkitt lymphoma observed in equatorial Africa – a rapidly progressive jaw or orbital tumor – is the most common presentation, occurring more frequently in young children. In western countries where sporadic Burkitt lymphoma occurs more commonly, this presentation is relatively rare. Nodal disease accounts for most presentations, commonly occurring in the abdomen. Abdominal disease can present with a variety of symptoms ranging from nausea, vomiting and a change in bowel habits to gastrointestinal bleeding and intestinal perforation. When involved lymph nodes are palpable, such as those in the cervical regions, involved sites can progress rapidly over hours to days, potentially leading to airway compromise. Extranodal disease is not uncommon, with numerous reports describing organ invasion, pleural effusions and ascites, as well as pharyngeal and sinus involvement. Bone marrow involvement is documented in roughly 20% of cases of sporadic Burkitt lymphoma and may be much less common in the endemic variant. Central nervous system involvement has been reported in up to one-third of patients, is typically associated with other sites of extranodal involvement, and appears more frequently in endemic Burkitt lymphoma. Other non-Hodgkin lymphoma (NHL) histologies need to be differentiated from Burkitt lymphoma. Diffuse large B-cell lymphoma (DLBCL) is the most common NHL and may have a MYC rearrangement in 5% of cases. Given the relative incidence of DLBCL, Burkitt lymphoma occurs less commonly in developed countries than MYC+ DLBCL. Cases with morphologic features intermediate between DLBCL and Burkitt lymphoma are termed “B-cell lymphoma, unclassifiable, with features intermediate between DLBCL and Burkitt lymphoma” as per the current World Health Organization classification. Differentiating these entities via expert hematopathologic review and appropriate molecular testing is critical given the major differences in treatment. Other lymphoma histologies, including lymphoblastic lymphoma and blastic mantle cell lymphoma, present in a similar fashion to sporadic Burkitt lymphoma in adults. In younger patients, Wilms’ tumor, neuroblastoma and soft tissue sarcomas should be considered in the differential. Burkitt lymphoma can be divided into sporadic, endemic and immunodeficiency-related variants. In developed countries where sporadic cases are most commonly encountered, Burkitt lymphoma can occur at any age, although the peak incidence is in the first decade of life. Roughly equal numbers of children and adults are affected. As such, Burkitt lymphoma accounts for 30% of pediatric lymphomas and less than 1% of lymphoma cases in adults. The disease incidence is 2-3 times higher in equatorial Africa. Termed endemic Burkitt lymphoma, the majority of cases are Epstein-Barr virus (EBV)-related. The immunodeficiency related variant is most commonly associated with human immunodeficiency virus (HIV) infection, where 1/3 of cases are also EBV-related. The diagnosis is most readily made by an excisional lymph node biopsy. In cases where an excisional biopsy is difficult, multiple core needle biopsies may be adequate. Expert hematopathologic review is essential. 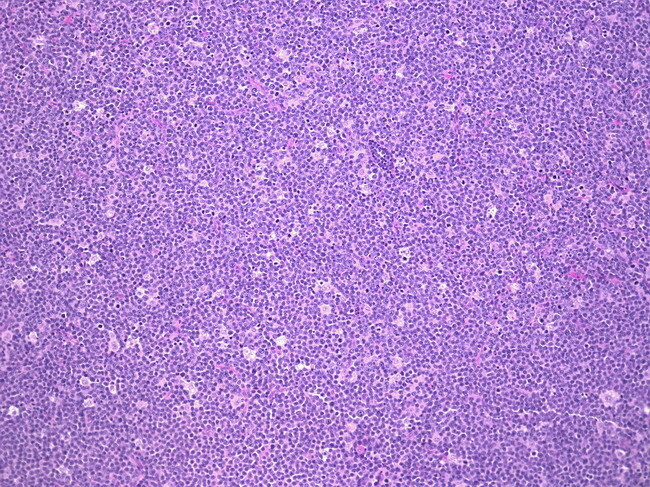 The distinct starry-sky pattern of classic Burkitt lymphoma, (Figure 1) in the setting of a histologic proliferative fraction approaching 100%, may quickly suggest the diagnosis while more unusual variants may be harder to distinguish. The most commonly used measure of proliferation is the Ki-67. In Burkitt lymphoma, nearly 100% of the cells stain positive for Ki-67. The “starry sky” appearance of Burkitt lymphoma characterized by benign macrophages interspersed amoung a diffuse infiltration of monotonous malignant lymphocytes. A translocation involving the MYC oncogene is identified in the majority of patients. Classic Burkitt lymphoma demonstrates the t(8;14)(q24;q32) reciprocal translocation involving the immunoglobulin heavy chain locus in 80% of cases. Variants involving the light chain loci, t(8;22)(q24;q11) and t(2;8)(p12;q24), are less common. Fluorescence in situ hybridization (FISH) to identify the MYC break-apart is routinely used along with routine karyotype analysis. Due to the molecular heterogeneity of chromosomal translocations causing MYC overexpression, polymerase chain reaction (PCR)-based testing to confirm their presence is not available. While diffuse large B-cell lymphoma can also demonstrate a t(8;14) translocation or MYC overexpression, this typically occurs in the context of other cytogenetic abnormalities. Routine staging studies, including computed tomography of the neck, chest, abdomen, and pelvis +/- position emission tomography (PET), and bone marrow aspiration / biopsy, are indicated in the initial evaluation and ideally should be expedited so as not to delay therapy. The Ann Arbor staging system continues to be used in adult patients. However, some individual treatment regimens have been developed with individualized risk-adapted therapeutic plans. In addition, a serum lactate dehydrogenase is used in treatment planning. Routine laboratory testing should include an evaluation of renal and hepatic function as well as testing for HIV. A study of cardiac ejection fraction is necessary for patients who will receive anthracyclines as part of their treatment. A lumbar puncture is indicated to exclude involvement of the cerebral spinal fluid. Despite the presence or absence of neurologic symptoms, this is frequently performed in conjunction with intrathecal chemotherapy as systemic treatment is initiated. The rapid institution of chemotherapy, ideally within 48 hours of presentation, is of utmost importance in Burkitt lymphoma. Aggressive hydration and recombinant urate oxidase (rasburicase) for hyperuricemia are currently recommended as prophylaxis against tumor lysis syndrome. Therapy in general consists of dose-intense multi-agent chemotherapy regimens. Some protocols employ a single less intense pre-phase chemotherapy regimen to provide additional time in completing the initial work-up as well as to further protect against tumor lysis syndrome and improve the patient’s performance status. The regimen has been refined over several investigations for adult patients leading to reductions in neurologic toxicity, myelosuppression, and mucositis. In turn, a two-year progression free survival of 64% has been reported in the 3 most recent investigations, albeit with the majority of patients studied being less than 40 years of age. Preliminary results demonstrate that incorporating the anti-CD 20 antibody rituximab does not increase toxicity. Regimens developed by LMB and BFM groups are similar in the chemotherapeutics used, dose-intensity and risk adapted design. However, limited data in adults is available. Data using the CODOX-M/IVAC regimen in HIV positive adults with Burkitt lymphoma suggests its feasibility in these patients. The Aids Malignancy Consortium reported on 34 patients treated with CODOX-M/IVAC plus rituximab. With a median age of 42 years and a CD4 count of 195/uL, 20 patients had severe myelosuppression and 14 had severe infections complicating therapy. With 1 treatment-related death, the 1-year progression-free survival was 69% and overall survival was 72%. Utilizing infusional etoposide, vincristine and doxorubicin, the dose-adjusted EPOCH regimen combined with rituximab appears to provide excellent results in a less intensive manner. A prospective trial reported on 19 patients treated with DA-EPOCH-R and 11 patients with HIV-related Burkitt lymphoma treated with a short course of EPOCH with dose intensive rituximab. After more than 6 years of f/u in both groups, the rate of freedom from disease progression were 95% and 100% in the HIV negative and HIV positive cohorts respectively. While designed to achieve an absolute neutrophil count of <500 cells per cubic millilitre, only 22% of DA-EPOCH-R cycles were complicated by febrile neutropenia. Further, severe gastrointestinal events were rare and grade 3 or 4 sensory neuropathy occurred in 17% of patients. This Cancer and Leukemia Group B developed regimen is a dose-intensive short-duration treatment plan lasting 18 weeks in duration. Following a seven-day cycle of cyclophosphamide and prednisone, patients receive alternating cycles of ifosfamide, methotrexate, vincristine, cytarabine, etoposide, dexamethasone with cyclophosphamide, methotrexate, vincristine, doxorubicin, and dexamethasone. The inclusion of prophylactic cranial radiation to high-risk individuals and the initially observed neurologic side effects may partially account for its limited use. Based on risk group, patients received 2-6 cycles of chemotherapy. For all patients except those with completely resected disease, treatment was preceded by a less intense prephase cycle intended to improve the patient’s performance status. More than 500 patients were investigated on this protocol, demonstrating excellent event-free survival rates. Further, they demonstrated that for patients with limited stage disease, the high-dose methotrexate dose and infusion could be reduced without compromising outcomes. Similar to the BFM protocol, LMB 96 was developed in children and adolescents. It is a dose-intense regimen where patients are stratified into therapy groups based on surgical resection of disease, CNS involvement, and degree of bone marrow involvement. This regimen also demonstrated excellent results in these younger patients and the ability to achieve comparable outcomes across risk groups by using prephase treatment, tailoring the therapy intensity based on the above factors and aggressively prophylaxing / treating patients for CNS disease. The hyper-CVAD regimen was initially developed for patients with acute lymphoblastic leukemia but has been evaluated in Burkitt lymphoma. Hyperfractionated cyclophosphamide, vincristine, doxorubicin, and dexamethasone is alternated with high dose methotrexate and cytarabine for 8 cycles. Results with and without rituximab have been encouraging, albeit in a more heterogeneous population than CODOX-M/IVAC was evaluated in. Regarding the optimal up front treatment regimen, comparative studies are not available. We have historically treated younger patients using the CODOX-M/IVAC protocol. Of the published variations on this regimen, all are reasonable options with comparable efficacy and toxicity. Additionally, we included rituximab with first-line treatment. Patients with HIV-associated disease have been typically treated in a similar manner. The NCI-generated results using DA-EPOCH-R suggest that excellent outcomes may be obtained with less intensive infusional therapy. However, this regimen requires treating physicians to adjust the doxorubicin, etoposide and cyclophosphamide doses based on neutrophil and platelet nadirs with each cycle. For older patients or those unable to tolerate a short-course, dose-intensive regimen, the dose-adjusted EPOCH-R regimen may provide the best risk to benefit ratio for this population. Standard RCHOP should be considered as being palliative in this population. Autologous stem cell transplantation has been evaluated as a consolidative strategy after patients have received initial therapy. While data are limited, results suggest comparable outcomes to those obtained with the short -course regimens listed above. Few options exist for patients who relapse after initial therapy. Typical salvage regimens used in diffuse large B-cell lymphoma such as ICE (ifosfamide, carboplatin, etoposide) or DHAP (dexamethasone, cytarabine, cisplatin) can at times be used to bridge patients to either autologous or allogeneic stem cell transplantation. Post-chemotherapy supportive care is critical given the dose intensity and subsequent side effects associated with standard treatment regimens. As such, close outpatient follow-up to monitor side effects and transfusion requirements is needed. Patients require appropriate inpatient resources and staff experienced in chemotherapy administration and their respective side effects. Most notably is the sophistication involved in the use of IV high-dose methotrexate. Patients require pre-treatment hydration and alkalinization, monitoring of urine pH, renal and hepatic function, rapid turnaround in methotrexate levels, attention to leucovorin rescue, and availability of carboxypeptidase in rare circumstances. Prevention and management of tumor lysis syndrome typically includes aggressive intravenous hydration and the urate oxidase, rasburicase. In the event of renal failure from uric acid nephropathy, management may include hemodialysis. Additionally, granulocyte colony-stimulating factor support as well as antibacterial, antiviral and antifungal prophylaxis are routinely administered. Burkitt Lymphoma is rapidly progressive and universally fatal in the absence of therapy. In patients able to tolerate a dose-intensive chemotherapy program, timely initiation and completion of therapy can result in long-term survival. While most patients will initially respond to treatment, progression-free and overall survival rates in adults have not matched outcomes in younger patients. Using the CODOX-M/IVAC regimen, investigators have reported two-year overall survival ranging from 67-92%. At five years, CALGB 9251 resulted in 52% of patients being alive and in complete remission. Three-year overall survival for hyper-CVAD has ranged from 49-89%. Six-year overall survival for DA-EPOCH-R has been reported to be 100%, albeit in 19 patients having a median age of 33 years. For patients who relapse after initial therapy, salvage options should be considered palliative given few patients achieving long-term survival. “The patient is too sick to receive chemotherapy”. Due to the rapidly progressive nature of Burkitt lymphoma, patients may present with evidence of end-organ dysfunction or a poor performance status secondary to lymphoma. Based on experiences with other malignancies, medical professionals and intensive care unit staff may assume that the patient isn’t able to tolerate chemotherapy. Patients with Burkitt lymphoma may experience a rapid improvement in function with appropriate treatment. Clinical trial experiences have demonstrated that temporizing measures such as fractionated cyclophosphamide or a single cycle of CHOP chemotherapy can allow for time to confirm the diagnosis and improve a patients performance status without compromising the patients change of cure. Measures such as these may also be used in the critically ill patient to optimize organ function prior to starting a dose-intensive regimen. “Lack of referral to a tertiary care center”. Given the need for close monitoring of patients during therapy, the use of high-dose methotrexate, and aggressive tumor lysis prophylaxis, most patients should be treated by staff experienced in managing Burkitt lymphoma. As such, clinical intuition and a prompt diagnosis are important to allow for transfer of the patient’s care. Normally functioning as a transcription regulator, constitutive overexpression of the MYC oncogene plays a primary role in the pathogenesis of Burkitt lymphoma. While c-MYC expression is not uncommon in other malignancies, this typically represents a secondary alternation occurring in the setting of clonal evolution. In Burkitt lymphoma, c-MYC overexpression typically results from a chromosomal translocation between the c-MYC oncogene on the long arm of chromosome 8 and either the Ig heavy chain gene on chromosome 14, the kappa light chain gene on chromosome 2, or the lambda light chain gene on chromosome 22. As a result of the MYC oncogene juxtaposing with one of the immunoglobulin gene loci, the c-MYC allele is expressed constitutively and cell cycle control is lost. Next-generation sequencing has revealed a number of diverse genetic abnormalities contributing to the pathogenesis of Burkitt lymphoma. Among the most common include recurrent silencing mutations in the tumor suppressor gene ID3 leading to constitutive activation of the transcription factor TCF-3. This promotes tonic B-cell receptor signalling, engaging the PI3K signalling pathway in addition to promoting cell-cycle progression through CCND3. Additional, more poorly understood genetic lesions simultaneously inhibit apoptosis. One such mechanism includes the Epstein-Barr virus (EBV), the genome of which is contained in tumor cell nuclei in some cases, mostly commonly in endemic and HIV related disease. This accounts for the majority of endemic African Burkitt lymphomas where it is hypothesized that malaria causes B-cell hyperplasia facilitating disease genesis in the setting of widespread EBV. This explanation does not account for the majority of cases in developed countries where10-20% of cases are EBV-related. The rapid nature of disease presentation and progression is the most salient feature obtained in the patient’s history. Insidious non-specific symptoms over a prolonged time course is uncommon. Inquiring about risk factors for HIV may be helpful in identifying immunodeficiency-related disease. Patients may have systemic complaints or B symptoms defined as fever of more than 38°C, weight loss of more than 10% of body weight, or the presence of drenching night sweats. Enlarged lymphadenopathy, abdominal masses, or organomegaly may be palpable on physical exam. In conjunction, a rapidly declining performance status may be evident. Analysis to identify overexpression of BCL-2, most commonly due to the t(14;18) translocation, is identified in a small number of cases by routine karyotype analysis or FISH. More rarely, a translocation involving the BCL-6 gene on chromosome 3q27 may be identified. These so-called “double hit” lymphomas have an extremely poor prognosis with a median overall survival reported at 2.5 months in one series. Dave, SS,, Fu, K,, Wright, GW. “Molecular diagnosis of Burkitt's lymphoma.”. N Engl J Med. vol. 354. 2006. pp. 2431-2442.